I’m going to PAX East next week. I’ve been to PAX Prime in Seattle a bunch, of course, but this is my first time at the east coast event. What’s good to check out? Where’s the good gaming? Are there weird and interesting nooks and crannies I should explore? One of the things I enjoy most about the big cons (GenCon, PAX, etc) is finding those hidden corners that are filled with unexpected things, whether that’s stumbling into a room filled with kids boffer-LARPing or the open music stage where total strangers could step up and jam together — and I mean real instruments, not Rock Band. Strange little ecosystems hidden inside the big show. I also know nothing about the venue, so if you’ve got tips, hook me up. Science! Invention! Experimentation! It’s what separates us from the apes. The ones on The Planet of the Apes. Those guys were very frowny-faced about new ideas. While I was working on the new version of Union, I also used that opportunity to experiment with some components of Microscope. The original Union was a variant that required the Microscope rules to play — even though the end result and the actual experience of play is very different — so of course in rewriting Union to be a stand-alone game I had to take a close look at whether all the pieces inherited from Microscope did what I wanted. There are two areas particularly that I revised in Union but which also have implications for Microscope: improving questions and de-emphasizing scenes. In both Microscope and Union, every scene starts with a question. That question is the spine of the scene. It defines the scope of the scene and (should) get us all on the same page on what we’re talking about. A good question is the key to making your scene flow. But telling players what defines a “good” question has always been a little fuzzy. There are some kinds that definitely don’t work, like completely open-ended questions, but just saying what not to do isn’t very useful guidance. In Union, I tried a different approach. Now the rules say that your question should be something that can be answered with a single word or phrase, including simple choices like yes or no. If your question can’t be answered that succinctly, it’s probably too open-ended. There are exceptions, but this is an easy test and a much better starting point for telling players how to make good questions. A common refrain I hear is that some people play Microscope without playing any scenes at all. Or that when they teach Microscope, they omit the scenes and introduce that mechanic separately later on. This is particularly true of teachers using Microscope in the classroom. And that makes a lot of sense, because there is *a lot* going on already. From the start, players are jumping in the deep end and coming to terms with having vast creative control, crafting and destroying whole worlds with a glance. Role-playing scenes, on the other hand, is a totally different kind of activity that engages entirely different skills. Instead of unilaterally narrating you’re jockeying in real-time and trying to read other players and collaboratively synthesize fiction on-the-fly. And that’s cool, both are good. And each player can *chose* not to role-play scenes on their turn and just dictate instead, but if anyone choses to do a scene on their turn, we all have to engage with this very different activity and tackle this new skill. In this new version of Union, what I did was simply reverse the assumptions: instead of role-playing being the default for scenes and dictating being the option, I made narrating vignettes the norm and then explain how you could also role-play scenes if you wanted to. Mechanically it’s all there, but the guidance is different. That may not seem like a big deal, but a big chunk of game design is helping players make good decisions and making it less likely for them to wander into bottlenecks. Or to think of it another way: if you (the designer) were at the table, what would you recommend they do? The rules should reflect what you would advise. Hello, America! Tomorrow is Election Day. Go vote. 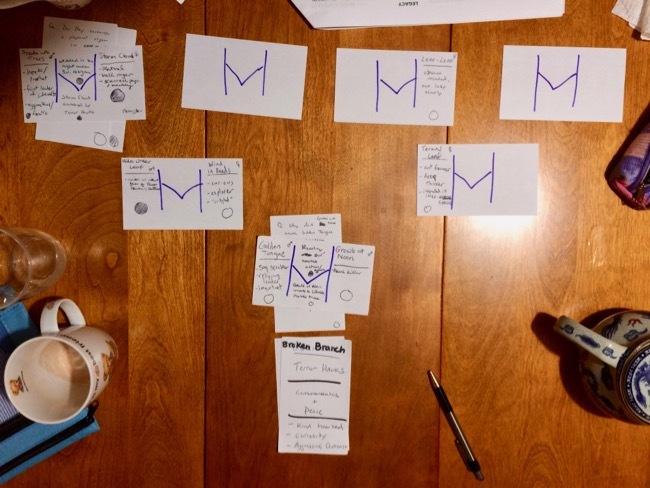 This summer I started working on a game about elections, hoping to get it into playtesters’ hands before now. That did not happen. That game is GLADIATOR. Choose your champion! Gladiator isn’t a game where you play candidates, it’s a game where you pick candidates. Y’know, the way voters do. It’s specifically about the primary process, where we try to pick someone who cares about what we care about and hopefully will go on to win in the main event. The underlying premise — and this is a true thing about the world — is that to win an election you don’t have to be the best person for the job. Not even slightly. You just have to be a better choice than the person you’re running against. You’re running against your opponent, not the real world, or even all the issues. Obviously a grand game to be playing in the season leading up to major election, but I hit some roadblocks in the design, sadly. Because the tree of game design must be refreshed from time to time with the blood of difficult projects. The new and improved second edition of Union is ready to go. Get in there and start making family histories, with all their moments of triumph and tragedy. It’s been a busy year, but the new, improved, revised, and rewritten Union is in final editing right now. It’s very close to be ready for your game table. Very close. I’m stupidly excited to have a stand-alone version of Union that people can just sit down and play. I’ve always thought Union was a very special game, but I never felt I really gave it the spotlight it deserved because it was hidden inside of Microscope Explorer. Union is a game of family and ancestry. You build a family tree and explore the lives of the people who came together to make each new generation. And yeah, if that family tree looks upside down, that’s because in classic Microscope-style we start by knowing the end, a descendent of all these ancestors, then jump back and forth to explore all the lives and loves that got us to this point. It’s really all about seeing how each of these people is the main character of their own story, even while they are part of the bigger story. Because without every single one of those past unions, that descendent could not exist. Union was originally a variant of Microscope, included in Microscope Explorer, as I said, but it was always really different enough from Microscope that it deserved to be its own game. If I hadn’t been doing Explorer, I probably would have just written it as a separate game from the start, since it has a very different feel and style from Microscope. I’m releasing it as a PDF only, which removes a lot of the overhead of doing print runs, maintaining inventory, shipping all over the world, etc. I’ve worked hard to make the rules as concise as possible so that printing it should be painless. The original version will still be in Microscope Explorer, of course, but if you want to play Union, this will be the one to use. This is the kind of thing that makes me happy to be a game designer. If you’re interested in Microscope in the classroom (or gaming as an educational tool in general), check out Robbie Boerth’s report. Great stuff.